This incredibly easy-to-make dessert treat is perfect for any occasion. 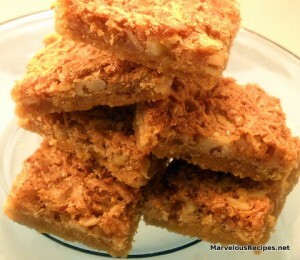 These toffee bars travel very well, making them great for picnics, family gatherings, and reunions, to name a few! 1. In a large bowl, combine the flour and brown sugar; cut in the butter until mixture is crumbly. Press into an ungreased 13 inch x 9 inch baking pan. Bake at 350 degrees F. for 8 to 10 minutes or until golden brown; cool slightly. 2. In a small bowl, beat the egg, brown sugar, vanilla extract and baking powder until well blended. Stir in the coconut and chopped nuts; spread over the crust. Bake for 12 to 15 minutes or until golden brown. Cool in pan on a wire rack; cut into bars. Makes 24 bars. Oh, these look so good, Emily!! I will definitely be making these! I wish we could share, too! Thanks for linking this recipe!! I know we will all enjoy it!! Best wishes for a wonderful weekend!! God bless!! These look so good, a great summer treat ! !